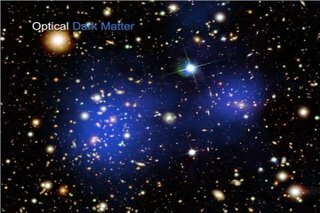 Cockermouth Astronomical Society: Seeing Dark Matter? Dark matter has been the subject of much debate in recent years. 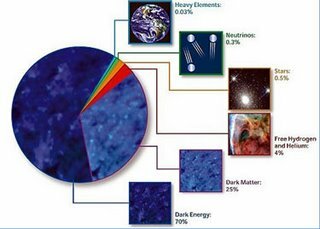 Essentially most cosmologists would have us believe that the universe is comprised of 5% 'ordinary matter', 25% dark matter and 70% dark energy. Ordinary matter is essentially everything we know about and can detect; galaxies, stars, gas, planets, electromagnetic radiation etc. Dark matter is essentially the additional mass that's needed to explain the observed movement in galaxies and galaxy clusters using Einstein's theory of gravity (general relativity). But one question has been; "Are we assuming that dark matter exists to compensate for a problem with general relativity?". If we had a modified theory of gravity would the need for dark matter disappear? Recent evidence obtained using the Chandra space telescope strongly supports the existence of dark matter. This article on the Cosmic Variance blog gives more details, and explains the whole issue better than I could.